An interesting book that puts the circumstances surrounding General Billy Mitchell's court-martial into perspective. Mitchell, a latecomer to military aviation but one of its strongest proponents, had made his name during the Great War as the combat leader of the United States Air Service in France. He was not its chief. When he returned to the United States he was made Deputy Chief of the Air service and worked with the Navy to prove that land-based aircraft (bombers) could destroy battleships during a demonstration off the Virginia coast. He was not its chief. He appealed directly to the American people for an opportunity to show what airpower could do by pushing for an air force co-equal with the Army and the Navy. He used newspaper articles and books to spread his ideas about airpower. For his troubles he was sent out to Fort Sam Houston, Texas. When the Navy suffered two aviation fiascos in one week (the destruction of the airship Shenandoah and the disappearance of a Navy amphibian trying to reach Hawaii nonstop from the West Coast) Mitchell could not help himself: he wrote a press release accusing the government, the Navy and the Army of frittering away the lives of pilots because they were ignorant of the needs and potential of airpower. 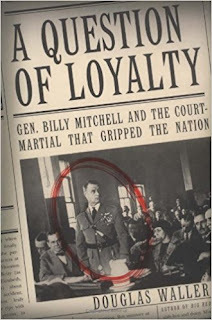 In doing so, Mitchell made many enemies (including the president). A good book, although the way it jumps forward and backward in time is a little hard to track at times. The author clearly has some research behind the material he uses. It also includes some helpful photos.